Scotty McTape Meets Woody Woodpecker. 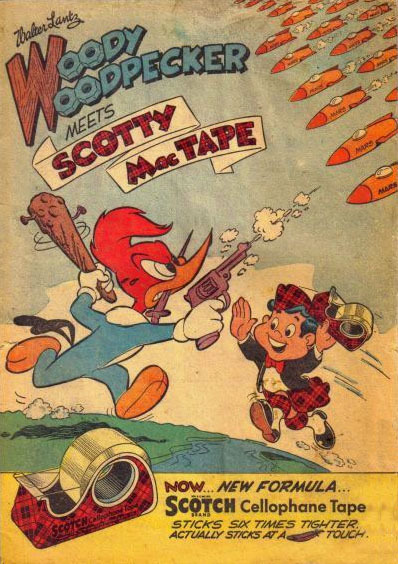 The plot for the Woody Woodpecker cartoon, Termites from Mars (1952) was actually adapted for a promotional giveaway comic book from Scotch tape entitled “Woody Woodpecker Meets Scotty McTape” (1953). Scotty made his first appearance as a mascot for Scotch tape in 1944 and was abandoned in 1974. In the animated cartoon, Woody uses a roll of cellophane tape to catch the invading Martian termites when all other efforts have failed. Of course, the comic book makes it clear that the victorious weapon was actually Scotch tape. Woody Woodpecker’s Voice. I know that Mel Blanc voiced Woody Woodpecker for his first two cartoons (and his laugh was still used until 1951 and his “Guess Who?” until 1972) and that Harry Babbitt did the famous laugh on the popular Kay Kyser version of the theme song. I know Danny Webb, Kent Rogers and Ben Hardaway also filled in for the woodpecker. Then Grace Stafford (Lantz) did the voice starting in 1950. Kenny’s Voice. 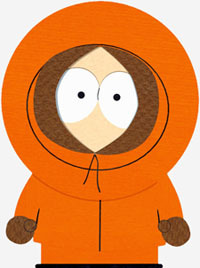 South Park co-creator Matt Stone usually does the unrecognizable voice of the character of Kenny McCormick except for one important moment. When Kenny removes his hood and speaks clearly at the end of the South Park: Bigger, Longer & Uncut (1999) feature movie, it is the voice of Mike Judge, creator of Beavis and Butthead. Guest voices for the film included George Clooney as Dr. Gouache, Brent Spiner as Conan O’Brien, Minnie Driver as Brooke Shields, Eric Idle as Dr. Vosnocker, and Dave Foley provided the combined voices of Alec, Billy, Daniel, and Stephen Baldwin. Most Excellent Voices. The first season in 1990 of the animated series Bill and Ted’s Excellent Adventures was produced by Hanna-Barbera and ran for 13 episodes on CBS featuring the voices of George Carlin, Alex Winter, and Keanu Reeves returning to their roles from the popular film. A second season of eight episodes ran on Fox Kids in 1991 and was produced by DIC Entertainment, with none of the original cast. Instead, Rick Overton, Christopher Kennedy, and Evan Richards took over the roles because they would portray the characters in a short-lived live action series on Fox in 1992 and were probably less expensive. The Whoopass Girls. Craig McCracken attended California Institute of the Arts and during his first year in the character animation program made a couple of short cartoons of a character called “No Neck Jones”. In June 1991, he took a small sheet of orange construction paper to do a quick birthday card with three girls for his brother. In 1992, McCracken developed those girl characters into the Whoopass Girls and made a short film entitled Whoopass Stew! The Whoopass Girls in: A Sticky Situation. Craig planned to make four shorts using the characters but only the first one was produced. The girls battle the Amoeba Boys who have robbed a bank and get physically stuck on them. The girls fly to the sun and the boys are vaporized. McCracken himself did the narration. Jennifer Fried voiced all the girls. When Cartoon Network picked up the concept for the What a Cartoon! Series, the name of the girls had to be changed to The Powerpuff Girls and the “can of whoopass” into Chemical X. The Brady Orphans. In 1972, The Brady Bunch show creator and executive producer Sherwood Schwartz approached Filmation about the creation of an animated series featuring just the kids. The original live action show’s six children (Barry Williams, Christopher Knight, Mike Lookinland, Maureen McCormick, Eve Plumb, and Susan Olsen) voiced their animated counterparts in the first season. Williams, Knight, and McCormick opted out of doing their voices for the five episodes that constituted the second season. Williams’s and McCormick’s voices were replaced by the children of producer Lou Schiemer (Lane and Erika Scheimer), while Knight’s voice was replaced by David E. Smith. Filmation adapted a lot of the animation like walk cycles from its previous series The Archie Show. In The Brady Kids animated series, the kids are basically orphans since neither their parents or their housekeeper Alice ever appear. Part of a Complete Breakfast. 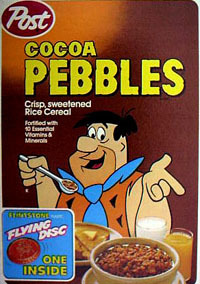 Fruity Pebbles and Cocoa Pebbles cereals were introduced in 1971. The Flintstones cast were the spokescharacters and this was the first time a cereal brand was created around media characters, rather than just having the characters promote the cereal. The original names considered for the cereals were Flint Chips and Rubble Stones. Some of the earliest commercials had animated Fred Flintstone and Barney Rubble interacting with live action children. 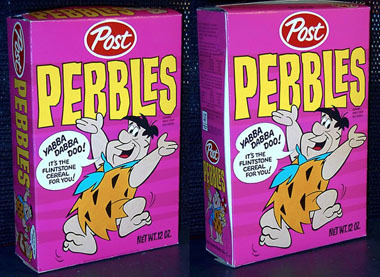 Over the years, there have been limited edition variations of the two classic cereals including Bedrock Blizzard (which later became Winter Fruity Pebbles), Cinna-Crunch Pebbles, and Dino Pebbles among many other versions. Don’t Ask. Don’t Tell. In the first Pepe LePew cartoon, Odor-able Kitty (1945), the amorous French skunk chases a MALE tomcat who has disguised himself as a skunk to avoid abuse from dogs and humans. At the end of the cartoon, it is revealed that Pepe LePew is actually a hen-pecked American skunk named “Henry” with two children and was faking the French accent. Bugs Bunny makes a cameo appearance in the cartoon. Animated Pilots That Never Made It. The proposed 1978 ABC animated series by Ruby-Spears of the classic comic strip “The Phantom” would have been set in a modern-day racially-integrated port city. The pilot written by Mark Evanier would have had the purple clad hero facing ghost horsemen. Marvel Productions produced a one minute demo reel in 1984 for a series based on Marvel Comics comic book developed for Tyco and their U.S. 1 truck racing set. Ulysses Stone Archer had a metal plate in his head and could activate his CB radio by running his tongue over his teeth. Wasn’t McCracken’s CalArts series called “No Neck Joe”? Yes it was. I’ve seen those. Despite an extremely talented staff, Billy West’s voices were the only good thing about the FOX Woody show. At least, the cartoons weren’t as bad as the last Smith shorts. I don’t care if they had Ross. The last Lantz shorts were still bad. Some additional info on the Pebbles cereals – they were basically a re-branding of “Rice Krinkles” and were initially “re-introduced” as “Pebbles” (no “Cocoa” or “Fruity” flavoring yet) in 1969, not 1971. Rice Krinkles in it’s original form would make a comeback later in the Post Snack Packs. I thought that WHOOPASS GIRLS episode was funny. Is that available on any of the POWER PUFF GIRLS box sets? 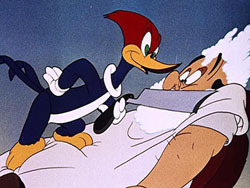 I wish I had seen one of the WOODY WOODPECKER cartoons featuring the voice of Billy West. He is a major cartoon fan, as far as I know, and probably would have enjoyed a re-emergence of Woody as the “jerk” character that appeared in the original 1940-s and some 1950’s cartoons. They’re decent but they have too much talk and not enough action. The FOX Woody show has been used as a filler in mexican TV for years. Every time I go somewhere in the morning and they have a TV turned on, Woody is there, making background noise, with no one paying attention to him. It’s surreal.